STAGE 1, SUNDAY 20th MAY, DROGHEDA – ATHLONE 136 KMS. Drogheda, Slane Category 3 KOM, Slane, Navan, Trim, Kinnegad, Milltownpass, Rochfort Bridge Apple Green Hot Spot Sprint, Rochfort Bridge Category 3 KOM, Tyrellspass, Kilbeggan, Horse Leap, Moate, Athlone. After getting underway in Dublin Castle for the past two editions, the 2018 Rás Tailteann will forgo Dublin and instead begin in Drogheda on Sunday, the 20th of May. 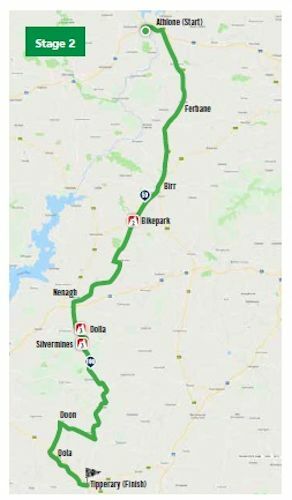 The opening leg takes the riders 146 kilometres to Athlone, and will feature two climbs and two hot spot sprints. Both will be important, with the former determining who will mention the King of the Mountains jersey at the end of the day, and the latter handing out time bonuses towards the overall classification. 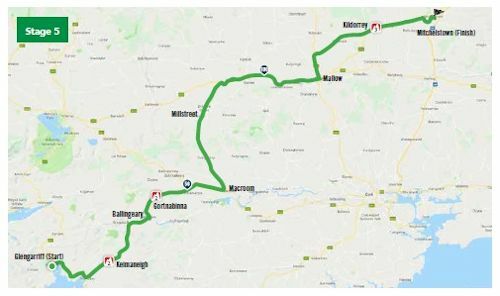 Following the drop of the flag the riders will race through Donore and then on to the category three climb at Slane, just under 14 kilometres after the start. They will then continue through Trim, Killyon and Kinnegad, before disputing the Hot Spot Sprints at Rochfortbridge (km 84.4) and Kilbeggan. In between those two gallops, the riders will chase points atop the category three climb at kilometre 88.1. After that, they will speed through Moate prior to the big finish in Athlone, where the stage winner will don the race leader’s jersey. 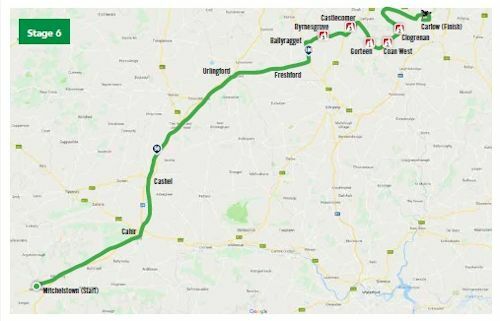 STAGE 2, MONDAY 21st MAY, ATHLONE – TIPPERARY 148.7 KMS. Athlone, Doon, Ferbane, Cloughan, Riverstown, Bike Park Category 2 KOM, Cloughjordan, Nenagh, Dolla, Dolla Category 3 KOM, Slievemines Category 3 KOM, Holyford, Cappawhite, Doon, Tipperary. Stage two will be the first test for the rider in yellow, and will likely be a nervous stage for him. After starting in Athlone and racing through Ferbane and Cloughan, the riders will begin the first category two climb of this year’s race. The Bikepark ascent will top out at the 50.6 kilometre point, and could well act as a springboard for a breakaway group. From there the route takes the riders through Cloughjordan and Nenagh, with the category three pairing of Dolla (km 88) and Silvermines (km 92.1) following. Those are the final categorised climbs of the day, with flat to undulating roads taking the riders through Hollyford, Cappawhite, Doon and Moynard prior to the finish in Tipperary. 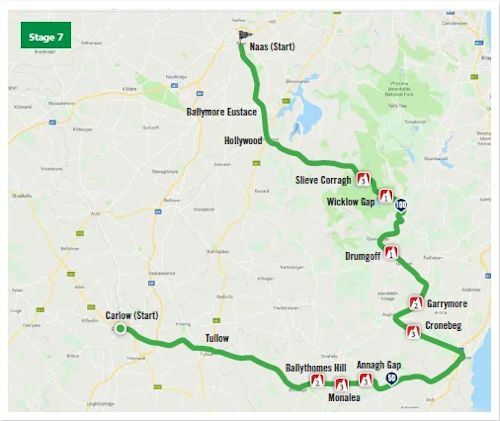 STAGE 3, TUESDAY 22nd MAY TIPPERARY – LISTOWEL 140.4 KMS. Tipperary, Brooksbridge, Pallasgreen, Dromkeen, Boher, Caherconlish, Ballyneety, Crecora, Patrickswell, Kildimo, Kilcoran, Foynes, Glin, Tarbert, Ballylongford, Asdee, Ballybunion, Lisselton, Listowel. Five years after WorldTour rider Sam Bennett won into Listowel, sprinters may well have another chance to show their speed at the end of this 140.4 kilometre stage. 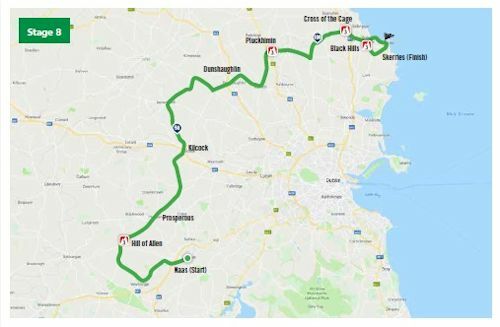 It is bereft of any categorised climbs, with mainly flat roads taking the peloton through towns such as Brooksbridge, Dromkeen, Caherconlish, Crecora, Patrickswell, Kilcoran and Ballybunion prior to a likely bunch finish. Speeds will be high and attacks frequent, with the possibility of wind along the coast potentially complicating things. STAGE 4, WEDNESDAY 23rd MAY, LISTOWEL – GLENGARRIFF 153 KMS. Listowel, Crinny Category 3 KOM, Castleisland, Farranfore, Category 3 KOM, Killarney, Ladies View Category 2 KOM, Molls Gap Category 1 KOM, Kenmare, Garranes Category 2 KOM, Lauragh, Healy Pass Category 1 KOM, Adrigole, Cooleraigh Category 3 KOM, Glengarriff. After the flat roads of stage three, the following day is substantially more difficult. No fewer than eight climbs loom on the 153 kilometres between Listowel and Glengarrif. The first of those, Lacka West, comes just 7.9 kilometres after the start and the category three ascent could provoke early splits. After that, the riders head on to the Crinny climb (category three, km 28.3), Castleisland, the category three ascent of Farranfore (km 47.3) and then pass through Killarney. 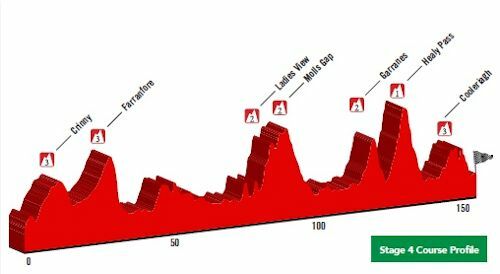 From there the peloton will be shaken up by a succession of mountains, starting with the category two trio of Ladies View (km 82.4), Molls Gap (km 87.3) and Garranes (km 117.1), then the gruelling Healy Pass, which comes 127 kilometres after the start and marks the first category one climb of this year’s race. The slopes are guaranteed to fragment the bunch and cause chaos but, with 25 kilometres remaining from there until the line and only the category three Cooleriagh (km 145.3) interrupting a fast run-in to the finish, there could be a regrouping of sorts. STAGE 5, THURSDAY 24th MAY, GLENGARRIFF – MITCHELSTOWN 150 KMS. Glengarriff, Ballylickey, Pearson’s Bridge, Kealkill, Pass Of Keimaneigh Category 2 KOM. Ballingeary, Gortnabinna Category 2 KOM, Renanirree, Lissacresig, Macroom, Carriganimmy, Millstreet, Rathcool, Banteer, Mallow, New Two Pot House, Doneraile, Kildorrery, Category 3 KOM, Glennahulla, Mitchelstown. After a harrowing day, the sprinters will be more in their element on stage five, a 150.2 kilometre race from Glengarriff to Mitchelstown. Inside the first hour of racing the riders will face the category two ascents of the Pass of Keimaneigh (km 25) and Gortnabinna (km 37.7), but after the latter there follows 100 kilometres of mainly flat roads, passing through Macroom, Millstreet, Banteer and Mallow. 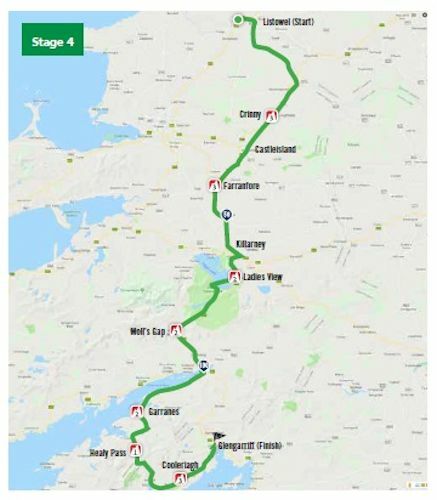 A bunch sprint may well be the most likely outcome, although those looking to write a different script have a chance to spark something off on the category three climb of Kildorrey (km 137.9). However, with 15 kilometres remaining from the summit until the day’s finish, things could well come back together. STAGE 6, FRIDAY 25th MAY, MITCHELSTOWN – CARLOW, 155 KMS. Mitchelstown, Kilbehenny, Skeheenarinky, Cahir, New Inn, Cashel, Horse & Jockey, Littleton, Urlingford, Freshford, Ballyragget, Byrnesgrove Category 3 KOM, Castlecomer, Castlecomer Category 3 KOM, Gorteen Category 1 KOM, Coan West Category 2 KOM, Bilboa, Clogrenan Category 2 KOM, Killeshin, Dr. Cullen Park, Carlow. Speeds will be high early on, not least because of the post office sprint at Urlingford (km 77.4), before things get considerably tougher after the 100 kilometre point. A total of five climbs will spice things up between there and the finish, including a category one ascent. The quintet of climbs are Byrnesgrove (category 3, km 108.7), Castlecomer (category 3, km 116.3), the first category wall of Gorteen (km 120.9), plus the second category pair of Coan West (km 124.6) and Clongrennan (km 133.5). STAGE 7, SATURDAY 26th MAY, CARLOW – NAAS, 141 KMS. Carlow, Tullow, Coolakenna, Shillelagh, Coolboy, Coolafancy, Ballythomas Category 2 KOM, Monalea Category 3 KOM, Annagh Gap Category 3 KOM, Coolgreany, Arklow, Woodenbridge, Cronebeg Category 3 KOM, Ballinaclash, Garrymore Category 2 KOM, Grennan, Drumgoff Category 1 KOM, Laragh, Wicklow Gap Category 1 KOM, Slieve Corragh Category 3 KOM, Hollywood, Ballymore Eustace, Punchestown, Naas. The penultimate stage of the 2013 An Post Rás is a monster, with eight climbs punctuating the race profile over just 141 kilometres. Of those, there are two first category ascents and two category two climbs, thus guaranteeing a big showdown in the fight for the yellow jersey. Beginning in Carlow, the riders will reach the first climbs inside the opening hour and half. These are Ballythomas Hill (category two, km 41.8), Mondlea (category three, km 44.9) and Annagh Gap (also category three, km 47.4). After passing through Arklow and Woodenbridge, the peloton takes in the category three Cronebeg (km 73.3) and second category Garrymore (km 81.4), then heads up the Glenmalure valley prior to the feared first category ascent of Drumgoff (km 92.5), also known as the Shay Elliott climb. Once past the summit and the memorial to Elliott, Ireland’s first wearer of the Tour de France yellow jersey, the fragmented bunch will plummet down the tricky descent into Laragh, then turn left towards Glendalough and onto the first category Wicklow Gap climb (km 107.4). Following the long grind to the summit, a sweeping descent takes the riders to the third category Slieve Cruagh (km 122.3), the final climb of the day, then on through Hollywood and Ballymore Eustace to the finish in Naas. STAGE 8, SUNDAY 27th MAY, NAAS – SKERRIES, 145 KMS. Naas, Newbridge, Milltown, Hill Of Allen Category 3 KOM, Allen, Kilmeague, Prosperous, Kilcock, Garadice, Dunsany, Dunshaughlin, Ratoath, Curragha, Pluckhimin Category 3 KOM, Garristown, Naul, Balrothery, Cross Of The Cage Category KOM, Skerries, (1st Passage) Black Hill Category 3 KOM, Skerries, (2nd Passage) Black Hill Category 3 KOM, Skerries Finish. Whomever is in the yellow jersey at that point must then negotiate just one more day in the saddle, a 144.6 kilometre race from Naas to Skerries. As has been the case in recent years, the latter part of this stage will follow familiar roads, including laps of the circuit in Skerries, and should once again attract huge crowds. After racing through Newbridge, the first climb the riders will encounter is the category three Hill of Allen (km. 15.6). 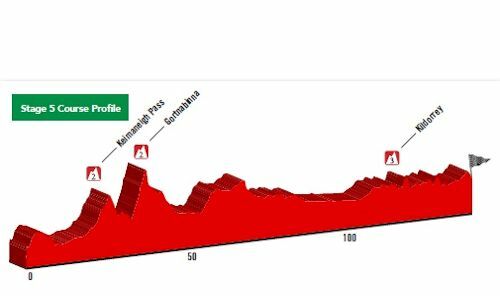 Next up is the similarly ranked Plukhimin (km 88.1) and Cross of the Cage (km 108), then the peloton will reach the finishing circuit and two ascents of the category three Black Hills climb (km 121.4 and 135.4). As ever a breakaway group will almost certainly try for the stage win, while those in the bunch may well mount one last assault on the yellow jersey before the bunch tears down the finishing straight in Skerries.